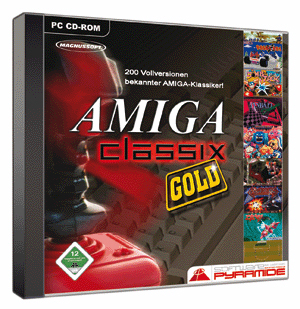 GO RETRO - with AMIGA CLASSIX GOLD, the ultimate game-compilation for retro gamers! On Windows, all games are startable with a single mouseclick, due to our fully menu driven structure of the CD. No matter if you prefer Action, Adventure, Strategy, Roleplay, Arcade oder Mindgames - with AMIGA CLASSIX GOLD you will get all the classics from the 80th and 90th back to your screen. Excerpt from the included games: Bomb Jack, Pinball Dreams + Fantasies + Illusions, Football Glory, Buggy Boy, Ghosts'n' Goblins, Nebulus, A320 Airbus, Space Harrier, Hybris, Rings of Medusa, Arkanoid, Paperboy, Joe & Mac, Der Seelenturm, Gremlins 2, Maupiti Island, Stormlord, Legend of the Exploding Fist, Vroom, Mortville Manor, Beyond the Ice Palace, ThunderCats, Battle Squadron, Master Axe, Exolon, Lure of the Temptress, Nemac IV, Disposable Hero, Zynaps, Hollywood Pictures, Battleships, Breathless, Wheelspin, Cybernoid 1+2, Beneath a steel Sky, Foundation, Slam Tilt, and a lot more! See also: Amiga ClassiX 2, Amiga ClassiX 3, Amiga ClassiX 4, Amiga ClassiX 5, C64 ClassiX, C64 ClassiX Gold, C64 ClassiX 2 und Retro ClassiX.